United States flag flown to the moon on Apollo 11 during the historic 1969 mission. Flag is mounted to an official NASA certificate reading: ''This flag traveled to the Moon with Apollo 11, the first manned lunar landing, July 20, 1969.'' 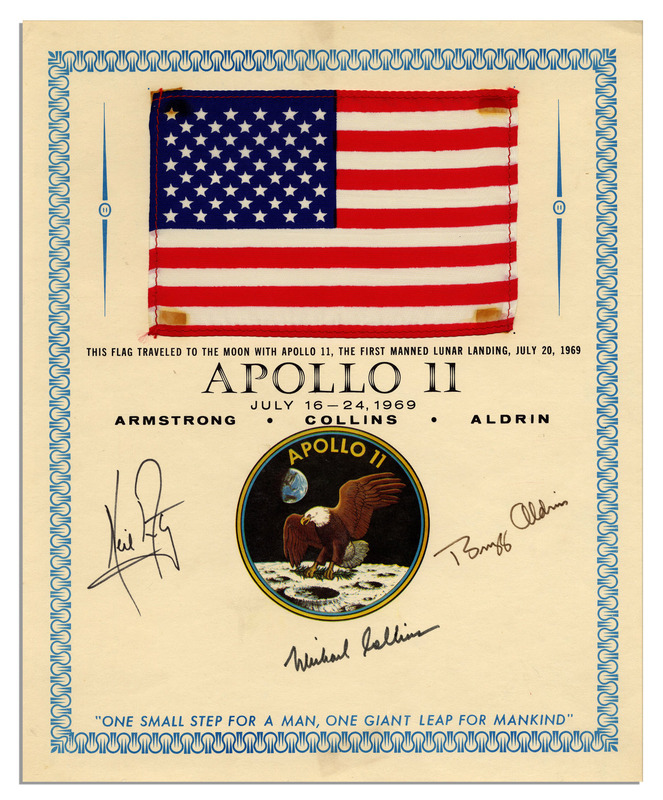 Certificate is signed ''Neil Armstrong'', ''Michael Collins'' and ''Buzz Aldrin'' in felt tip and has the Apollo 11 crew emblem near the center. Printed along the bottom edge are the first words by Neil Armstrong after stepping upon the moon: ''One small step for man, one giant leap for mankind''. The silk United States flag measures 6'' x 4'', mounted to the NASA certificate, which measures 10'' x 12''. Some show through of adhesive to flag corners and light toning to certificate, else near fine. Auction closed on Thursday, January 30, 2014.